KIGALI, Rwanda, March 20th, 2018 -/African Media Agency (AMA) /- The Next Einstein Forum (NEF), an initiative of the African Institute for Mathematical Sciences (AIMS) in partnership with the Robert Bosch Stiftung, today announces the top 16 finalists for its second edition of the Challenge of Invention to Innovation (Ci2i) innovation competition to be held at the NEF Global Gathering 2018 in Kigali, Rwanda on 26-28 March 2018. The finalists, young scientists and entrepreneurs, will compete to win the top prize in three categories: Data Science and Deep Tech Innovations, Personalized Health Innovations and Climate Smart Innovations. « At the NEF we believe that inventions, especially science-driven ones that can be scaled up, are critical to Africa’s transformation. The NEF Ci2i challenge rewards research based innovations and products that have a direct impact on our communities. The selected finalists’ innovations address climate change, various health challenges and push the envelope by proposing new data science or advanced (deep tech) technologies. We look forward to seeing all their ideas come to life, » said Mr. Thierry Zomahoun, President and CEO of AIMS and Founder and Chair of Next Einstein Forum. The NEF received 133 applications from which the top 16 were selected. The top 16 will pitch their innovations in three categories to judges for three to four minutes each, focusing on impact and scalability. The final two in each category will then present in plenary on the 28th of March. The winner will be announced live at the closing ceremony of the NEF Global Gathering 2018. 1. Donatus Njoroge (Kenya): His innovation « Molepse Bio resource oil/powder » is both a repellent and toxic to all major post-harvest pests. The product is formulated from essential oils of different plant species that are available locally. Pest mortality is noticeable within five minutes of fumigation while repellency is immediate. His product is a plant-derived bio-pesticide that helps curb post-harvest losses of all grains. It has enabled farmers reduce pest infestation and take control of health issues associated with synthetic pesticides. 2. Dickson Ayuka (Kenya): He is a Co-Founder of UjuziKilimo Solutions that collects and analyzes farm data using sensors, GPS, satellite and mini weather stations to help farmers and agricultural stakeholders make precise decisions. The UjuziKit is a GPS and internet enabled device with sensors that is installed in farms to monitor the levels of nutrients, weather, soil PH and moisture content which directs water, lime and fertilizer nutrient application rates based on the local requirements. 3. Isaac Brenya (Ghana): Brenya will be presenting on which Ecovon aims to revolutionize how building materials are made by completely rethinking and redesigning how new generation building materials are made. Ecovon is developing sustainably sourced, newly engineered wood made from coconut husk and sugar cane bagasse, supplying the global market with a formaldehyde-free bio-based wood alternative that is better for people and the planet. 4. Rachel Sibande (Malawi): Rachel established Malawi’s first innovation hub, mHub in 2013. She seeks to use maize cobs as a biofuel to run a gasifier based electrical system. The system will provide affordable power to underserved communities, schools, health centers and local enterprises in Malawi where only less than 10% of the population are connected to the grid. The ash and co-products from the power system are up cycled to create Compressed Earth Blocks to build cheap houses among other methods for economic development and job creation. 5. Isaac Sesi (Ghana): He is the Co-founder of Sesi Technologies, a technology startup which manufactures affordable hardware and software technology for farmers and other stakeholders in the agriculture sector. Isaac’s innovation, GrainMate helps grain farmers accurately measure the moisture content in their grain crops before storage. By using GrainMate, grain farmers can tell the exact moisture content in their grains and know whether they are ready for storage or have to be dried some more. This helps reduce contamination of grains due to aflatoxins and other microorganisms which cause post-harvest losses in grains. 6. Dr. Lahbib Latrach (Morocco): Dr. Latrach is the Founder & CEO of Green WATECH, research scientist and an inventor. The patented innovation (Multi-Soil-Layering technology) is a new low cost and efficient wastewater treatment method. MSL technology is designed to be used to manage and reuse domestic wastewater in rural communities and decentralized sites. It consists of water filtration using available and low-cost materials such as soil, gravel and sawdust. 1. Abdoulaye Diallo (Guineau): Prof. Diallo is a co-founder of My Intelligent Machines (MIMs) which created the MIMsOmic, a Software as a service (SAAS) platform leveraging artificial intelligence, natural language and Bioinformatic domain-specific workflows to help life-scientists and physicians working in academia, hospitals, health organizations, pharma, biotech and agri-food industries perform self-serve genomic research and biovigilance. With an AI managing natural language, biological knowledge and bioinformatic workflows in real-time, MIMsOmic empower life- scientists and physicians, giving them a real-time access to genomic-informed knowledge, catalyzing their creativity and increasing the efficiency and standardization of their collaborative research. 2. Davy Uwizera (Rwanda): Uwizera is working on S-Transport, an artificial intelligence solution for public transport in African cities. The system monitors using camera sensors in buses and at bus stops and includes GPS trackers. It feeds data on the number of passengers and waiting passengers and location data to map passengers and busses. This provides data for the transport operator to monitor buses on the road and passengers demand through a dashboard. Passengers can have access to data through SMS notifications via information panels at bus stops. Third, S-Transport provides a fleet management solution. 3. Oday Samad (South Africa): Oday is currently working on Sign Project. The Sign Project works to prevent incidents arising from maritime travelling by designing a technologically advanced life jacket. 4. Tobi Dwoeye (Nigeria): Dwoeye is carrying out research using patient generated data to assess the effects of pain medication administered to pregnant women and address the outcomes using mobile/ web digital identities and computer based deep or machine learning to reveal hidden patterns, create situational awareness, positively affect clinical practice and produce undeniable evidence based results. 5. Magondu Wairimu (Kenya): Wairimu is the Project Manager at eLimu. They created a literacy app, Hadithi Hadithi, geared for 6 – 8 year olds with stories written in local languages from Kenya, Uganda, Somalia and South Sudan. The app covers the curriculum and each story has sentence making, spelling and letter tracing games, and follows the scientifically proven Reading to Learn pedagogy. 1. Conrad Tankou (Cameroon): Dr. Conrad Tankou is a medical doctor from Cameroon. He founded GIC Space, a social venture that developed GIC Med. GIC Med is a Telemedical and Digital Microscopy project targeting breast and cervical cancers. This innovative solution permits target women not only have to access to screening and diagnosis by medical specialists, but equally sets a platform to ensure treatment and follow up. 2. Joel Gasana (Rwanda): Joel is a final year medical student at the University of Rwanda, a social health entrepreneur and founder of the Companionapp. Companionapp is a mobile application connecting HIV+ patients and their doctors to increase the follow up of patients and improve adherence to Antiretroviral medication (ART). Companionapp aims to increase the ART adherence to 98 %, decrease the consequences of poor adherence like mortality, drug resistance and to reduce the HIV/AIDS mother to child transmission to less than 1% in the Sub Saharan Africa in less than 10 years. 3. Emmanuel Owoebu (Nigeria): Emmanuel is a medical doctor, social entrepreneur and mobile health enthusiast with passion in public health, research, ehealth and ICT4D. He created the OMOMI solution that allows mothers monitor the growth and development of their children, quality health information and access to medical expertise 24/7 touch the touch of a button. By using behavior change modification, continuous learning and providing simple DIY skills and techniques his solution is trying not only to solve the acute problem of lack of access but provide a long-term solution to problem of maternal and child mortality. 4. 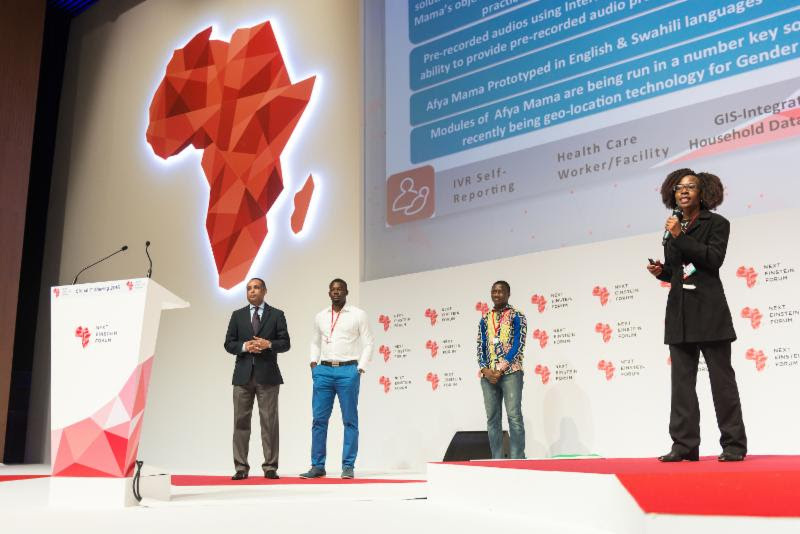 Muranyandzi Rushambwa (Zimbabwe): Munyaradzi is designing a system through which doctors can get real time physiological information about patients from anywhere in the world. This system helps to give better assessment of individuals by top quality physicians from anywhere in the world. He is using the IoT technology to lower healthcare consultation cost and increase healthcare service coverage to remote areas. 5. Daniel Nyabdza (Zimbabwe): Daniel is founder of Digitech which developed an electronic handheld smart cane for the visually impaired that makes use of image recognition services and other artificial intelligence services facilitated for usage by IBM Research (South Africa). The technology offers a greater degree of navigational freedom and contextual awareness of environment for blind candidates to enable them to be aware of their environment as if they had the gift of sight leveraging real-time cloud artificial intelligence services. Distributed by African Media Agency (AMA) on behalf of the Next Einstein Forum. A travers ce site nous entendons faire entendre une nouvelle voix de l’Afrique. Une Afrique qui se trace une nouvelle voie. Celle de son développement économique et social. Une Afrique debout. Une Afrique à la conquête de sa place de leader dans le concert des Nations. Une Afrique LEADER. Un site pour la promotion du LEADERSHIP AFRICAIN. Copyright © 2014 Africaleadnews . Tous droits réservés - RC: SN-DKR-2013-A-10165 NINEA: 0048422342.